I have watched the following video enough times since it was released that I probably could have driven down to Nashville to buy myself a pair of $300 jeans for the time I've wasted in wonderment at what an incredible retail outlet this is, from its conception to every element of its execution (as experienced virtually). The store and studio were built in an old service station. Imogene + Willie sell their own line of high-quality blue jeans, dresses, and shirts, jeans from other American-made denim lines like RRL, "vintage cowboy boots, hamam towels from Turkey, and hand dyed scarves from India." I love all the little details in the video, the song is really catchy and the camera work and editing are just beautiful. You almost forget it's a commercial. [I'm linking to the video on youtube because I have no idea how much they must spend on bandwidth with the video on their main page; definitely watch it over there if you're interested]. They also have a blog (and I really wish they had a web store or a clear way to order from outside Nashville). It's been a little over a year since I cleared my closet of all clothing that wasn't either made here in the USA or by a few select heritage brands made in Europe without sweatshop labor, and I'll admit it can be hard sometimes to find non-vintage pieces that are affordable. That said, I'm willing to pay for quality materials and craftsmanship and this video shows a retail concept that has the potential to inspire others with a passion for designing and making clothing (or anything else) here in the United States. It really seems like Matt and Carrie Eddmenson have started something amazing. Like I said, I haven't been there yet but when my friend gets married down in Nashville later this year, Imogene + Willie is the first place I'm going to visit when I get there. I think this also speaks a lot about some savvy use of the internet to market a small retail establishment and a new brand that most people would probably never hear about. I mean, who am I but some cheap schlub up here in Detroit. 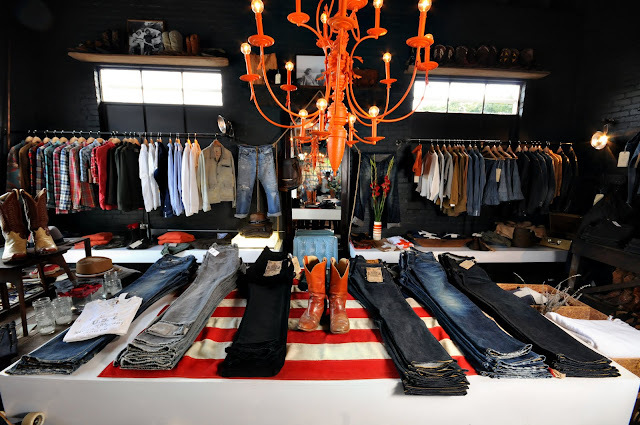 If the whole site and concept of the store make me want to go down to Nashville to try on some $200-300 blue jeans, maybe there's some hope for other small businesses to promote their own brands and for some other American manufacturers to get a toe hold in places like Detroit, Pittsburgh, Cleveland, Cincinnati, and other beautiful, overlooked cities where people used to make things.